So the electric car. Nothing new there you’ll tell me, and you’d be right. In fact, in the 1900s, they were more popular than petrol-powered cars. Then suddenly they disappeared, only to reappear almost a century later and try to regain popularity. What happened? Answers to that question vary, from conspiracy theories, to production costs, to the age-old question of range. Looking at the cars on offer today, with the exception of the Tesla Model S, I can understand the concept of range anxiety. Most electric cars today offer a maximum range of 160km. Compared to the average range of a petrol-powered car, of about 500km, this does seem like an issue. But is it really? Is that difference of 340km enough to justify not even considering electric cars as viable alternatives? Let’s find out…. Readers of my blog will know I have driven electric cars before, notably the infamous BlueCar, which you can use in the Parisian car-share program, Autolib’. I liked the car, but it had some serious flaws. 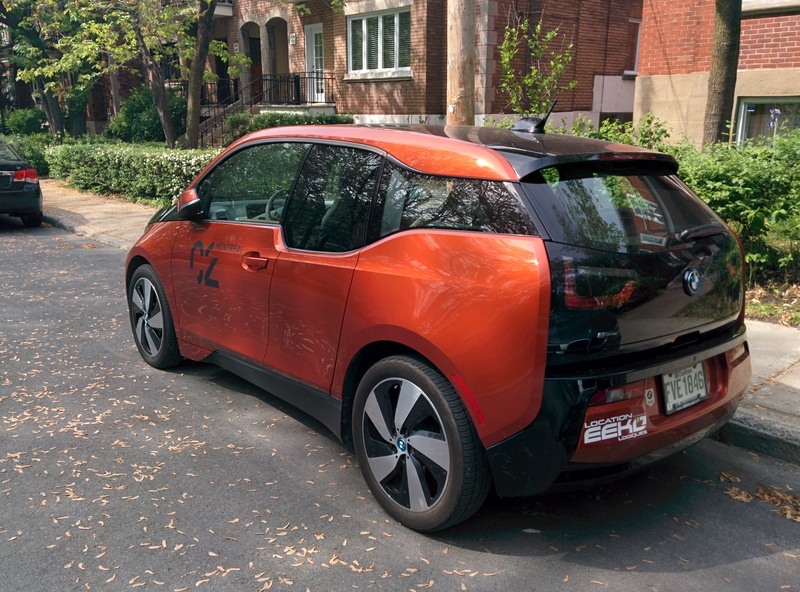 A few years later, I got the chance to live with a real electric car, one that I have written about before and that I am genuinely interested in: the BMW i3. This was no ordinary road-test either, I actually had the car from Monday to Friday, your average work-week. So how did it go? Before I go on recounting the experience, first a bit of context. A few months ago, I met the great folks at EEKO Rentals. 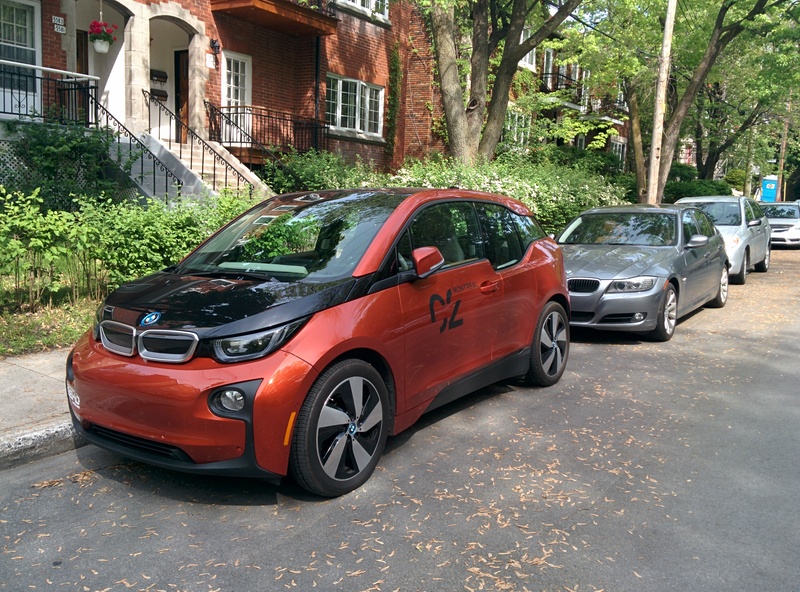 They are a small Montreal start-up that specialise in renting electric cars. With the exception of a couple of vehicles, they offer every single electric car you can find in Québec for hire. Want to try a Model S, they have it. Intrigued by the Kia Soul EV, it’s there. Want to experience the lunacy of the Chevrolet Spark EV? Yup, it’s possible. Think of them as any other big rental car agency, only better. The company is really interesting, and I try and help them however I can. A few weeks ago, they asked if I could lend a hand, driving VIPs at the C2MTL conference, as they had partnered with the event. We were to offer an i3 and Tesla Model S 85 as transport in the city for the conference speakers. Needless to say, I drove the i3. On the face of it, things did not look great. The range, though advertised at 160km, was in reality shown to be 100km. That can’t be good… When I got the car, it only had 70km of range, and I was told I would need to pick someone up at the airport, 20km away. So going and return would be 40km, which would seem like plenty, and yet, I did not feel comfortable. Before heading to the airport I decided to charge the car a bit, just in case. 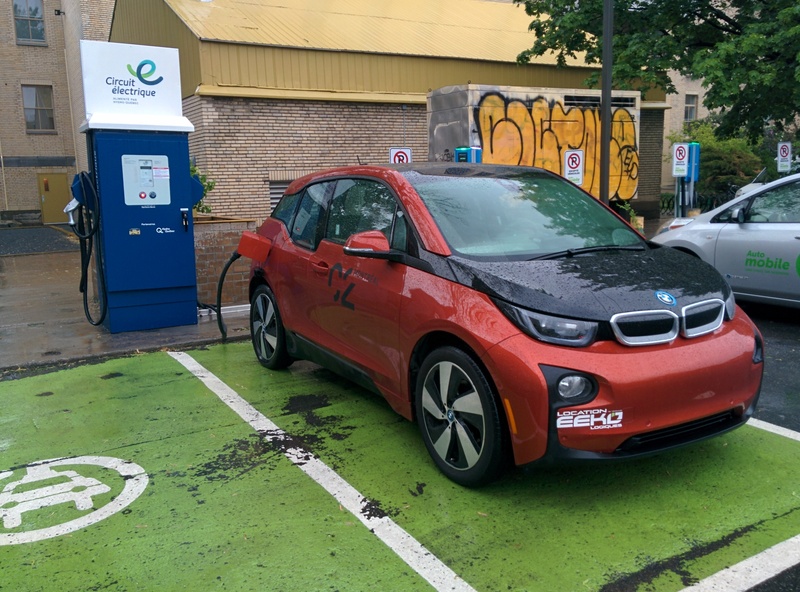 Thankfully, in Québec, electric charging stations can be found easily, with the Circuit-electrique website. It tells you where the stations are and if they are in use. I looked at the map, found a station nearby and drove towards it. All very handy. Unfortunately, the station was in use… So I looked at the map again, found another station close by and went there. This time, success! The station was free, so I plugged the car in. Was it difficult? Put it this way, I sometimes got more confused trying to figure out how to pay and fill my car up with petrol at some regular stations. After about a half hour at this 240V station (and $2.5 paid by EEKO) I had gained 10km, which seemed like enough. I then drove to the airport, picked up my passenger and drove back. It all went perfectly, and in the end, because it was mostly stop and go traffic, I only used 42km of range (I had the aircon on). After this first trip, I decided to try a fast-charging station. Once again, it was very easy to find on the map. This time, the process was still very straightforward, but a little intimidating. Compared to regular charging stations, fast-chargers are big, with different plugs, warning labels and big STOP/START buttons. Plug your car in and the station makes noise! It almost felt as if Nikola Tesla himself was in the fast-charger forcing the electrons through the cable and into the little i3! (just to be clear, it was less noisy than a regular petrol pump) I waited 20 minutes, and gained about 45km of range. It may not seem like a lot, but the way fast-chargers work is that they charge very quickly to 80%, but those last 20% take the longest. After this new experience, I headed home in the little i3 and prepared myself for the next few days. The next few days went very well. I basically spent my time going from the venue to hotels, driving downtown, getting stuck in traffic. When driving in the city, the range projections given by the car are realistic. If I drove 2km, the range would drop 2km. Put on the aircon, and it would drop another 2km. In the end, each day, driving in the city, I maybe drove 30km. Every night I topped the car up at a charging station, but not once did I feel any range anxiety. As I knew I was staying within the city, I knew I would never drive more than 15km in one go. I also knew that charging stations were everywhere, and simply waiting 20 minutes would be enough to get me to the other side of the city. Moreover, since I was in an electric car, traffic was not an issue. When you are not moving, the car does not use much energy, compared to a petrol powered car. This was a change for me, and altered the way I saw traffic. Put it this way, I hate traffic. I can always remember that time, on the M25 near London, in my Golf GTI, stuck for 2 hours straight. I also clearly remember my fuel gage dropping by a quarter in that traffic and my clutch slowly disintegrating. If I were in an electric car, my mood would have been different. And even if I were stuck in an electric car in traffic for 2 hours, I would at least have aircon, and using it for that much time only drops the range by 15km, I know, I tried. This brings me to another point as to why an electric car is so awesome: tranquillity. Sure, the BMW i3 is probably one of the best cars I have spent time in, (more on that in a proper review), but the lack of sound, the lack of wasting resources in traffic and most importantly that instant torque, make the electric car THE best city car ever. I would even argue that a Mercedes S-Class Coupe would not be as good. The electric car is quiet, so you’re less stressed, it is fast, so when you see a spot you just accelerate and it’s yours (seriously, I was sometimes genuinely concerned that I had skipped the red light, as each time it turned green, I just pressed the pedal and as I reached the other side of the intersection everyone was still stationary in my rear-view mirror), and because the i3 looks so different, people react to it differently. Passers-by stop and take pictures. Other motorists let you cut in. This would not have happened if I were in a BMW M6. Try an i3, you’ll see! So how to conclude this little post? Easy: if 90% of your travels are in the city, get an electric car. If you like comfortable places, feng shui and standing out, get a BMW i3. Yes, when I first got in the electric car, I did experience range anxiety, but that was because I did not know anything about electric cars. Once I actually started to use it in a real world context, I realised there is no need to be anxious. Even with 100km of range you can still drive comfortably. 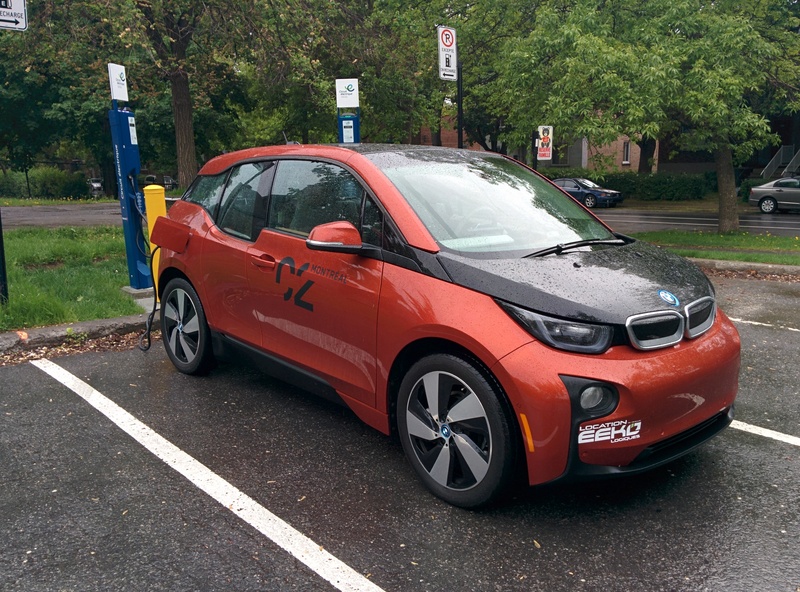 Sure, I can’t go to Toronto in the BMW i3, but that’s why there are cars like the Volt or the Tesla Model S. In the end, our fear of the electric car is basically our fear of something new. We don’t understand how it works, but once we use it, we realise it’s actually pretty good. Just remember the first time you got an Android phone or iPhone. It’s the same thing and you charge those more often. This entry was posted in Philosophy of driving and tagged autolib, bluecar, bmw, c2mtl, driving, eeko, electric car, feng shui, i3, tesla, traffic. Bookmark the permalink. Very interesting first hand experience. Keep it up Kevin. Excellent article. Changed my perception of electric cars in general. I got a feeling my next car will be electric. “When you see a spot you just accelerate and it’s yours”, interesting indeed. I like the idea of the quickness and the sensation that brings.